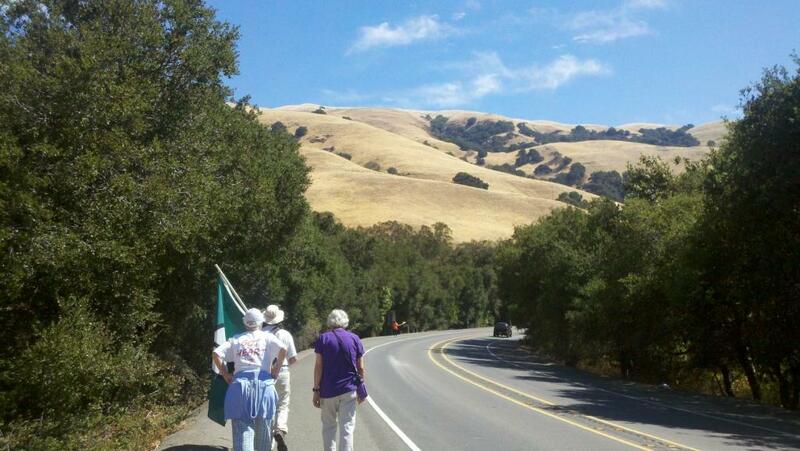 Today the four-day Walk for Nuclear Disarmament ended as Susan Crane returned to prison in Dublin, California. Susan’s incarceration is a witness to peace and noncooperation with evil, and her physical confinement is a visible symbol of the very real imprisonment we all experience, living with the existence of nuclear weapons. Know that we walk with you, Susan, each day as you carry the Light of Hope, Love, faith and compassion, which is hourly bringing transformation of minds and hearts, beginning with each one of us, of course. Below are some of the thoughts shared by the participants on day three of this four-day, 40 mile walk. We walked though Niles Canyon today, it was a walk made possible by working support vehicles driven by Margo Shafer and Bill Joyce, and by George Cammerada, who had an orange vest and orange flag; George was able to slow the traffic down and let them know there was something happening ahead. At one point I counted the drivers who waved to us….out of the next 10 cars that came by, 7 gave us a wave or a peace sign! That is a lot to think about. 70% of the people in the US just knee-jerk want peace? Seems so. We believe it. Our shoes are dusty, and our feet are tired. I guess that’s the nature of walks. We feel good together, and this walk for nuclear disarmament is too short. Tonight we are staying at the Trinity Lutheran church in Pleasanton. Folks here are very friendly. Sr. Fran Tobin, from Anne Montgomery’s community, walked with us today. Anne is getting weaker each day, so Fran walked with us in her stead. I think that starting with the circle we had at Sunnyvale, it’s easy to look around such a small circle —it seems one could get the feeling that the circle is so small, but the whole walk makes me think of the spirit —we don’t know the effect of the prayer of our walking, and I gathered a lot of strength. We aren’t here to judge or measure, but just carry on. The main perk of driving the sag was the opportunity to repeatedly catch glimpses of the beautiful banner-bearing procession — led by george, so proficient at flagging cars down to slower speeds along the tight canyon curves. At each point, and especially when joined by the mother pushing her child in the baby carriage, inspiring enough to break your heart. For me, this walk shows how widely people from diverse cultures, religions, and ages agree fully with the stand Susan has taken. Those we asked to host us HAD to agree because in their hearts they knew this is what they believe too about eliminating nuclear weapons. If we had asked them to come to a vigil or write a letter they may not have been so committed. It had to be a walk, close and personal, and, unfortunately for Susan, it had to involve a level of commitment that risks her own freedom, at least for a time. I’m grateful to be a part of this. I had the ultimate experience walking with Susan in support of her dedication to free the world of weapons of destruction. Susan is the most dedicated person who I know and her example give me strength to give my life to the Lord and serve the men in our county jail. I look forward to spending time with her in the coming months. 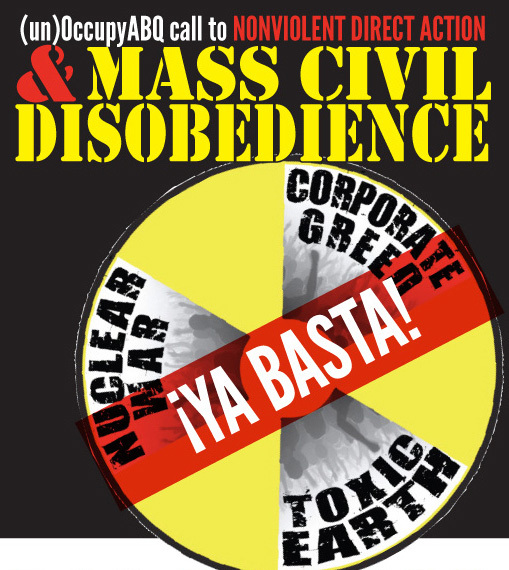 Very cool experience today as a part-time anti-trident activist! One day in 1000 qualifies me. Humbling as cars/trucks buzzed by us flipping us off but more commonly smiling and signaling the peace sign. I felt privileged to walk with Susan; that’s why I came after all. She and God call me to witness against the horrors of the world and wear this cloak for a short time…wishing I could do it more full-time. Susan is a surrogate for so many of us; a hero; a courageous soul that stands tall to shout out love and resistance for the perpetuation of the species. The walk has been a journey in many ways. It seems like we have been walking so much longer than three days with all the people who have greeted us along the way and people of peace who joined us for any amount of time that they could spare to help us say ” No to nuclear weapons, no to nuclear war, and no to nuclear proliferation.” Tonight we are tired but it is a good tired and we have definitely formed a community and I can feel it to the core. I am grateful to have witnessed this message. Tomorrow will end our time together when we take Susan to the prison but in many ways it will be new beginnings with future walks along the way. I’m writing this as a driver of one of the two sag support vehicles. The walk really was a complete success – very colorful – and the walkers’ energy was so impressive. I was continually amazed at the speed with which they walked and their consistent energy. However the Nile’s Canyon section of the walk was on the nerve-wracking side for us drivers. The road had lots of turns, the cars were moving fast, especially in our direction, (which was the opposite side of the road from the walkers), and there were many sections of the road that had no shoulder. We would pull into a turnout (all of which strangely had “no stopping any time” signs – why make a turn out if you can’t stop? ), then we’d wait for the walkers to pass, and when they got out of view we would drive to the next turnout and wait. This stop and start pattern went on all day, but the morning was the more stressful Niles Canyon part. At one turnout Bill’s battery went dead, and I drove on by myself until AAA got him going again. We’re very tired tonight, but relieved that the walk went so well. We’ll all be there in the morning to give Susan our love and to see her off to prison. Here is a photo from today’s walk. It seemed like our visit to that Methodist/Episcopalian community was something that the different congregations there came together to support. Our faith and action was a little different than theirs, but several people clearly were intrigued and grateful for the reflections our activism and anti-nuclear cause stirred in them. The pastor Ernie walked with us for the first leg in the morning too. Angie’s chicken adobo and their homemade Egg McMuffin-type things kicked our morning off right. The presence of Margo’s granddaughters brightened everyone’s day, even after they left. Couldn’t resist the photo by the valley of peace. During the march today, we were on well-traveled streets almost the whole way. A few residential neighborhoods were mostly devoid of pedestrians, but other, busier areas had plenty of traffic (though still not a lot of walkers). We received many peace honks even though we didn’t bring a “Honk For Peace” sign; people just knew! We spoke with Steve Kelly and Megan Rice. At all junctures, while the occasion of these people’s trials and general legal issues is the context for raising anti-nuclear issues, the real point we are making isn’t that nuclear weapons are unsafe, it is because the very existence of nuclear weapons makes the world unsafe. It was a beautiful, sunny day as approximately 40 of us gathered for an outdoor mass near the Lockheed-Martin plant in Sunnyvale where they manufacture the Trident II D-5 submarine-launched ballistic missiles. Invoking the God of Peace while standing in the shadow of the merchants of death was not new to Fr. Louie Vitale who conducted today’s mass. The City of Sunnyvale was kind enough to send five or six police cars to ensure a peaceful gathering. They must have misinterpreted Fr. Louie’s rap sheet in deciding how many cars to dispatch. Eric Debode’s rousing music inspired everyone who had come to share this time together.We also remembered Sr. Anne Montgomery who, while our mass was being conducted, was being presented with the Courage of Conscience Award. Anne is quite weak, although she continues to want to hear about our activities. After mass we walked one block to the Main Gate area of Lockheed Martin, arguably the world’s largest exporter of weapons. We vigiled there with most of the forty of us standing over the blue line. Over trails, side roads, bike paths, and highways, we walked 11 miles to the St. Joseph the Worker Episcopal Church/Holy Child Episcopal Church/Sunnyhills United Methodist Church. We were invited to share a bountiful and delicious meal with the Filipino community there, who gave not only food but also encouragement for our work abolishing nuclear weapons. It was a wonderful coming together in community. I give thanks for all who came together today – those who prayed together, walked together, and who provided hospitality to us. We welcome everyone in the name of Peace to join us. For more information or to join the walk, see the Disarm Now Plowshares events page. Plowshares activist Susan Crane will be accompanied by members of the Pacific Life Community as she walks to federal prison in Dublin, California. 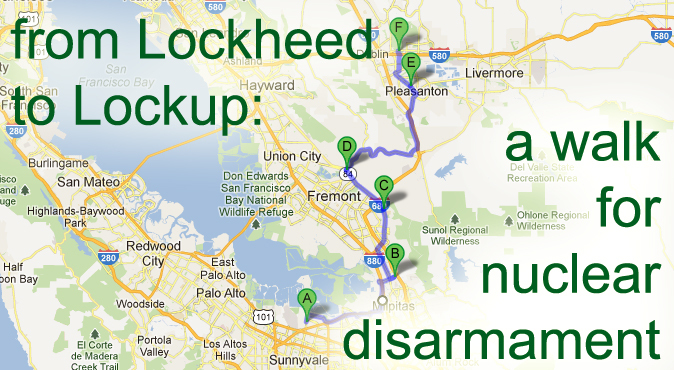 The walk will start on August 19th at nuclear manufacturer Lockheed Martin. As a continuation of the plowshares action she undertook with four others in 2009, Susan has refused supervised release and will serve two months in prison, having already served her original fifteen month sentence for protesting the Trident nuclear-armed submarines. All those participating in the walk join their committed efforts with those of Greg Boertje-Obed, Sr. Megan Rice, Michael Walli, and all who resist nuclear weapons. Our friend Susan Crane has been ordered to return to the prison at Dublin, California on August 22nd. If you haven’t read the summary of Susan’s July 23rd probation hearing you can read it here. She was given 60 days of additional prison time. The court continues to protect the very weapons that threaten all of humanity with destruction by incarcerating those who speak out against the illegality and immorality of these horrific weapons and our nation’s continuing pursuit of them. The prisons are the hammer that protects the bombs. It is therefore appropriate that Susan has chosen to make the long walk to the Dublin prison from the Lockheed Martin facility in Sunnyvale. This is the facility that manufactures the Trident II D-5 ballistic missile that is deployed on the Trident submarines. 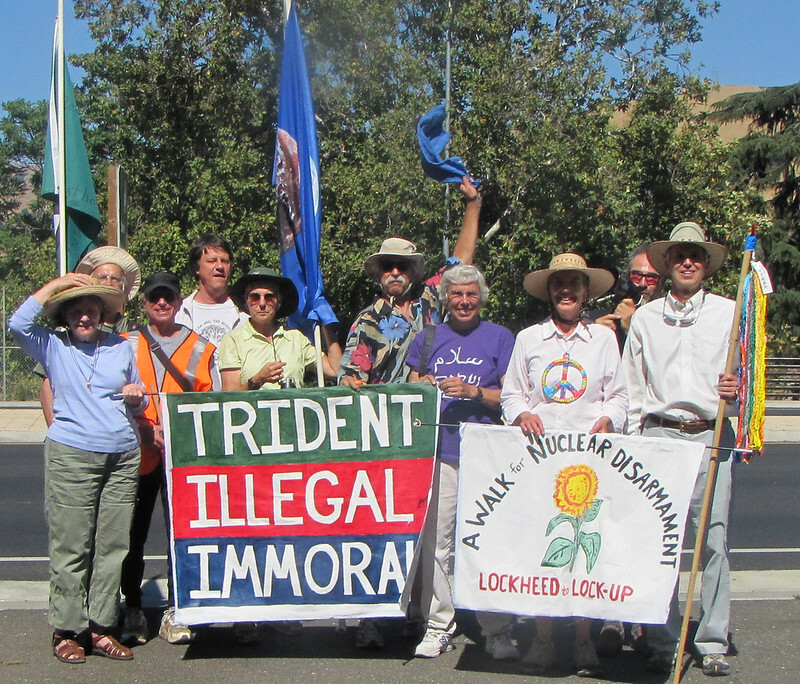 This Peace Walk for Nuclear Disarmament: From Lockheed to Lock-Up will be an opportunity to connect the oppression of a retributive justice system to the nuclear weapons that are the ultimate expression of oppression over the entire world. There will be one or more support vehicles following the walkers, and lodging each night. For more information, see the Disarm Now Plowshares events page.